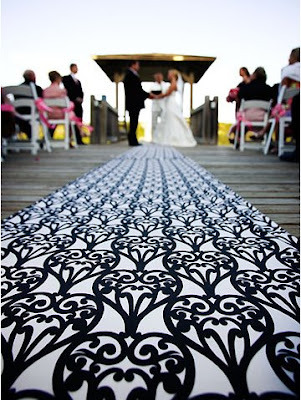 In 2008, I shared this eye-catching aisle runner that I wanted to share again. While many places of worship do not encourage aisle runners, your venue might need a little sprucing up, much like the wooden deck above. I love the graphic element it adds to the ceremony. Personally, I would take the same graphic element and use it on the ceremony programs for a coordinated look. Looking for a custom aisle runner? Contact Alicia & Jill at Events by I. Candy - they can design something to fit any bride's vision! Love it, I agree about the programs. Really makes it look pulled together. wow, that is an incredible looking aisle runner! I love this!!! Thank you for reposting! This is a very cool find - you could incorporate the pattern in so many elements as a simple way to keep your wedding design cohesive. Love it!